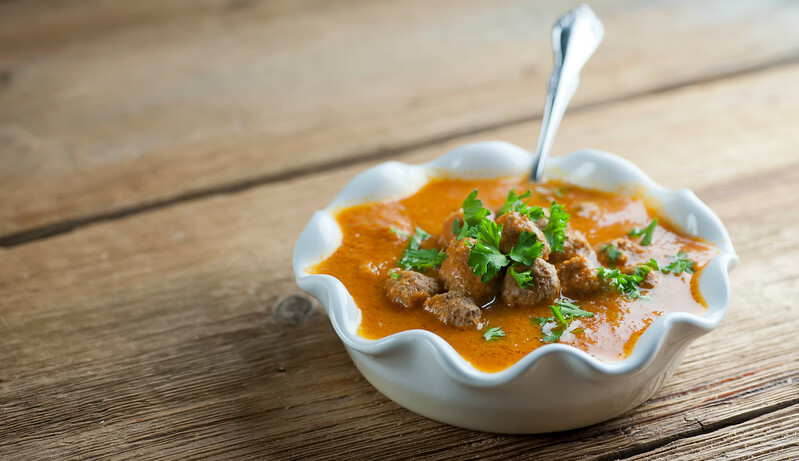 This easy recipe for creamy tomato meatball soup is not only a snap to make, it’s also Whole 30 compliant for those of you who are Whole 30-ing. And if you aren’t, it’s still a bowl of delicious, warm and wonderful tomato soup deliciousness! So, did everyone have a merry holiday and and happy New Year’s Eve? We did, and them some. We ate all the cookies and all the chocolate and all the cheese, and drank all the wine and you KNOW we ate all the holiday dessert. We reveled into the night and then got up and had breakfast sandwiches. And then on January 2nd we tried to button our jeans. Um. So in our house, when there are jeans-buttoning issues, we dive into the Whole 30, which you can find out more about by clicking here, but in a nutshell is thirty days of getting back to a healthy eating of veggies and protein and healthy fats and while there is no wine or chocolate or cheese, there are loads of great things to eat. 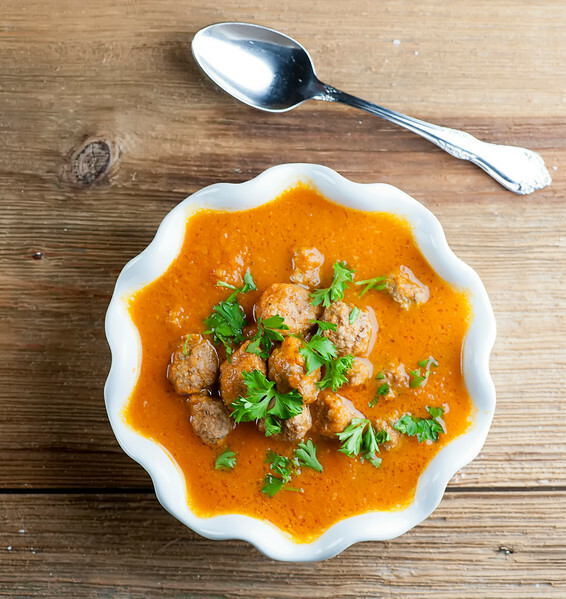 And one of them is this dreamy creamy tomato meatball soup. Ready to be warm and wonderful and healthy? Let’s make it! One of the best parts of the holidays is that we had the Engaged Couple home with us, including for New Year’s Eve which hasn’t happened in a long time. 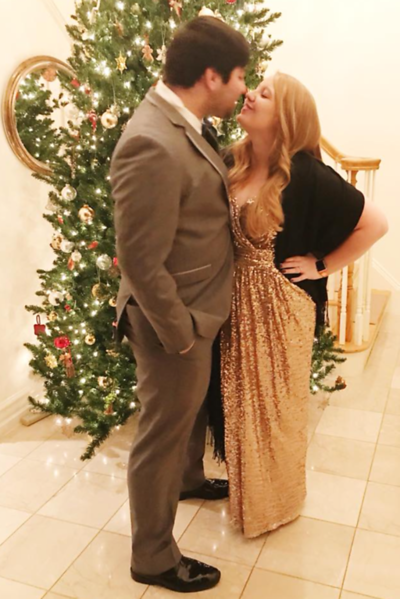 My brother threw a black tie New Year’s Eve party, and you KNOW they weren’t going to miss that. Nope, a little time on the Rent The Runway website and the Southern daughter was looking like a head over heels in love movie star. Her ancient parents didn’t look so bad either, even if MY outfit came out of my own closet. The Southern husband is wearing the exact same tux he wore to our wedding lo these 26 years ago. Show-off. When we got to the party there was pate and caviar and champagne and margaritas. And karaoke. That up there is the musical stylings of myself and my little brother singing “Who Says You Can’t Go Home,” which happily nobody did after they heard me singing. He is a professional, which was probably the saving grace there. 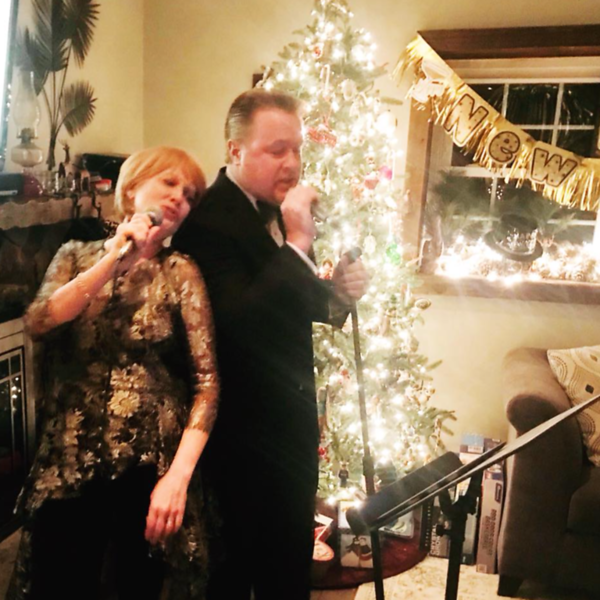 I also sang along with my little sis (also a professional singer – WHAT HAPPENED TO ME?) 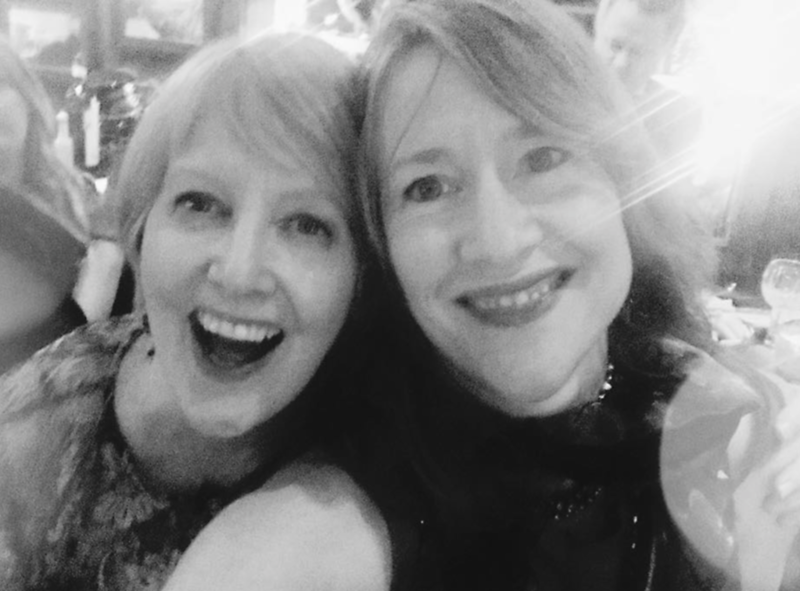 and one of my favorite New Year’s Eve companions. Anyway, now that we are into the New Year, I’m actually happy to be back on the straight and narrow, so long as the straight and narrow includes things like this easy peasy soup. If you are also Whole-30-ing this month, click here for my full repertoire of compliant recipes, but if you aren’t and you are just a tomato and meatball lover, give this one a whirl. And most of all, the happiest of new years from my festive family to yours! Heat olive oil in a large deep pot over medium high heat. Add onion and saute until soft, about 5 minutes. Add onion, tomatoes and coconut milk to a blender and blend until smooth. Pour mixture into the onion pot. Combine meat, egg and spices and form into tiny meatballs – no more than an inch wide and smaller if you can manage it. It’s going to look like way too many meatballs for the soup, but I promise it will be fine! Bring the soup to a simmer, and then gently drop in the meatballs. Simmer until the meatballs are cooked through, about 10 minutes. Taste and adjust seasoning as needed and serve, garnished with chopped fresh parsley. 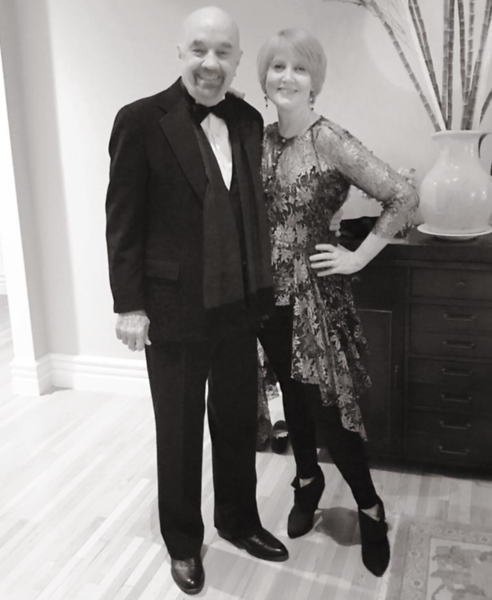 Your New Year’s Eve was A LOT more exciting than my night at home on the couch with a movie! You all looked so glamorous! And the Southern Daughter doesn’t look like she is “acting” much with the totally-in-love-with-this-guy look. :) I’m not doing the Whole 30 thing (wine & cheese & bread are life!!) but I can definitely do this soup. And what’s more cozy than soup when the temps outside are well below zero. (Pay no attention to the grilled cheese sandwich that I will be serving alongside.) Happy New Year, Kate! Oh, she is definitely head over heels! :). And you have a grilled cheese for me, okay? xo! The answer to what happened to you is that you sang “I ate all my pie” and never looked back!! Looking forward to singing that with again soon. Meanwhile, I’ll make the soup. Fun pictures and congrats! You look great yourself Kate! I’m not a fan of dried oregano and that’s an interesting choice of spices for the meatballs. I’m curious to know why you picked those spices. I made it but used a smaller amount of oregano, it was delicious!! The tomato soup is creamy goodness. I love your blog and make a lot of your recipes. Thank you for another keeper! I loved the simple creamy tomato soup. Other than Italian Wedding Soup, I don’t usually think of putting meatballs in soup, but this is a great idea. I had frozen lamb meatballs left from a batch I’d made late last year, so defrosted them and used them in the soup. The seasoning was different but it worked quite well (though I love oregano too). Maybe it’s cheating to rate the recipe when I only made a small part of it, but having the template for making soups like this in the future makes it worth all the stars!